Peaceful, natural and romantic—these are the words that no doubt spring to mind when you think of a rural landscape. You notice the gentle light and the complementary tones and colours, and, most of all, lots of open space. By contrast, the city is more closely associated with being noisy, dirty, aggressive and crowded. The light is harsh and directional, and the surroundings are awash in greys with clashing colours—not to mention, a comparable lack of space. The city is an assault on the senses for both you as a photographer and for your wedding party, but with a little shift in perspective, it can be just as visually stimulating. What photographers don’t always consider is that the essentials of composition in the city are no different when shooting in nature. You just need to use the basic elements and principles of art—colour, line, shape, space, plus a dash of situational spontaneity—to create visual impact. 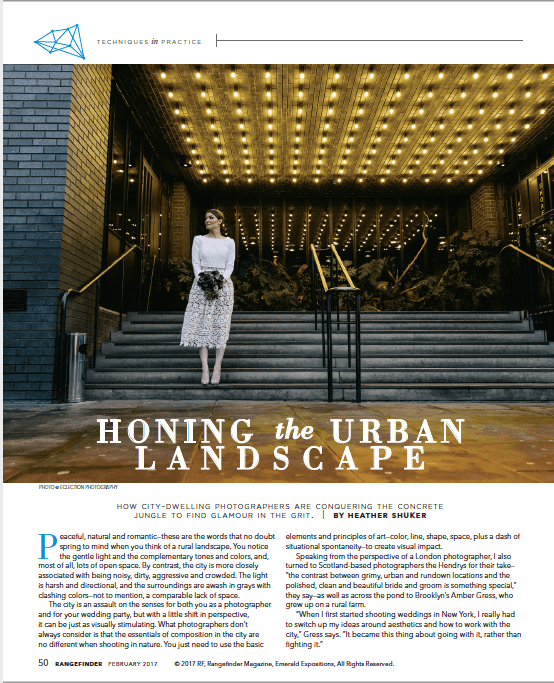 Read the full feature on how to photograph wedding in the City over on the Rangefinder blog and the February issue of Rangefinder Magazine..